Could you be a Parish Councillor? – Elections are being held for our 7 Parish Councillors. Nominations must be hand delivered to the Returning Officer before 4pm on 3rd April. IF the election is contested the poll will take place on Thursday 2nd May. The recipient of the 2018 Blackshaw Parish Community Award is Steve Hoyle. He was nominated for the ‘phenomenal amount of work he does within the community’, quietly and without fanfare. The award was presented by outgoing Chairman Roger Butterworth at the Annual Meeting of the parish on 21st May. What are we working on currently? Below are some of the issues that the parish council has been dealing with recently. Broadband – Many of our parishioners have very poor broadband access and the parish council have had several meetings and have been pushing very hard to get infrastructure improvements. The ‘superfast’ fibre only comes as far as the cabinet at Jack Bridge, and despite the fact that at one point the relevant bodies did say that they would extend this up the hill into the village cabinet, this now seems unlikely. We feel we have reached a bit of an impasse, but this report entitled Broadband Solutions for Blackshawhead parish written by Matt Baker is extremely useful in detailing all the potential options for our parish. Flood remediation and prevention work. Our parish was hugely affected by the recent floods down in the valley bottom at Charlestown and the parish council has played a significant role in various flood groups over the last few years. In particular, Vice Chair Mick Davies has put much effort into the flood resilience work, chairing the COmmunity Flood Resilience Group, attending other meetings and putting forward ideas. Blackshaw Parish Council was created in 1894 out of the much larger and ancient Stansfield Township as part of a major national re-organisation of local administration. The Parish Council has seven Councillors, who are elected every four years. For a list of current councillors, click here. The Council normally meets in Blackshaw Head Methodist Church although meetings could be held in the nearby Hebden Bridge Town Hall, as part of an agreement with Calderdale Council dating back to 1974. Meetings are held on the fourth Monday of the month except in May and December. Meetings discuss such things as local planning applications, issues with roads and footpaths, reports from other meetings in the Calderdale area, and often have invited speakers. In recent months we have had speakers from Calderdale Council on the potential of CCTV in Blackshawhead, from BT and Superfast West Yorkshire on fibre broadband, and Yorkshire Water on the steps taken to resolve issues with water mains stoppages. The Parish Council owns and manages the allotments site in Charlestown (for which there is an allotments committee), and the area of land around Great Rock. The council also produces a newsletter once a year, plays a role in events such as the annual fete, pays for and helps manage this website, and keeps residents updated on local issues using the googlegroups email list. The May meeting is also the Annual Parish Council Meeting when the Chair for the year has to be elected. According to statute the Chair is still known as “Chairman”. 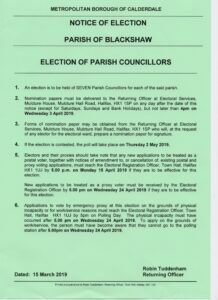 The May meeting is normally held on the second Monday of May because Parish Council elections are normally the first Thursday in May after which the Council is legally required to meet within ten days. The May meeting is preceded by the Annual Parish Meeting to which members of the public are invited. All meetings of the Parish Council are open to the Press, members of the public and at the discretion of the Chair everyone is allowed to speak – though it is preferable to notify the Clerk or Chairman at the beginning of the meeting if you do wish to speak. Meetings are publicised on the two official notice boards (at Underbank in Charlestown and on the road beneath the Methodist Chapel in Blackshawhead) on this website and via email to the Blackshaw Googlegroup. The WayaHead Committee is responsible for developing the Parish Action Plan and meets two or three times a year. The Chair of the Committee is usually not a Councillor. Being a small Council all the Councillors are members of the committee but they are usually outnumbered by local residents who become members by attending. The meetings are usually more informal than the Parish Council meetings. Blackshaw is a predominantly rural South Pennine Parish within the area of Calderdale Metropolitan Borough Council and is a part of the Calder Valley Parliamentary Constituency. The bulk of the Parish is part of the Calder Terrace moorland fringe and upland pasture framed by the moorland tops, Noah Dale, the wooded Colden and Jumble Hole Cloughs and crossed by the Pennine Way. The Parish stretches from the valley settlement of Charlestown on the busy A646 between Hebden Bridge and Todmorden to the high moorland plateau on the border with Lancashire at Hoof Stones Height (479 metres high). The upland settlement of Blackshaw Head sits on the ancient trans-Pennine “Long Causeway” 12 miles from Halifax and 7 miles from Burnley. On 1 December 2009 there were 399 people registered on the electoral roll for Blackshaw and 323 for Charlestown. It is estimated that there is a population of approximately 1,000 people. The Parish has one Church, known as Blackshaw Head Methodist Church or Chapel, and one pub The New Delight. The area is served by two primary schools, Colden Junior and Infants and Hebden Royd, both of which are just outside the Parish Boundary. There are no shops in the Parish but the nearby award winning “Mays” farm shop at Colden provides an excellent service not only delivering newspapers and magazines but also providing an invaluable delivery service to the elderly and housebound.